Glorious summer weather at Grosmont yesterday day with Ian, myself and Nigel Hall a little later. After the usual cup of tea, Ian and I took scrapers, brushes and paraffin cleaning equipment down to the running shed and got stuck into cleaning the left hand side of the frames. We also took two upright lighting stands as the far end of No4 road is just a little dark, even in the noon day sun - and it was also a bit cooler than outside! 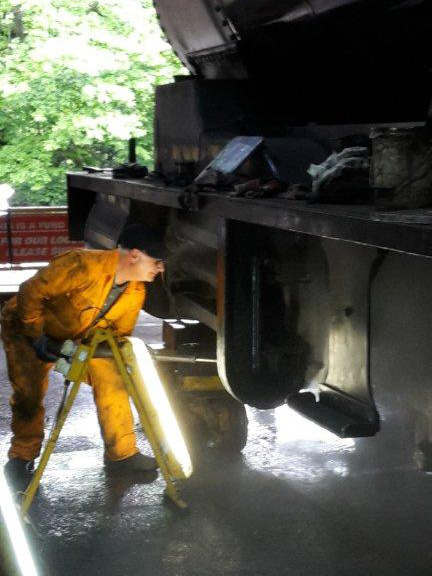 The most difficult bits were removing the ingrained rail dust, which, after cleaning off the loose material, Nigel advised he would clean up with an orbital sander, and getting behind the slide bars. After lunch, which we had on the bench outside Deviation shed, Nigel suggested we should have a go with the NYMR steam cleaner as there were no underkeeps to trap water. After a lesson (aka training!) on how to use it from Charlie Wood, we completed the left side then did the whole of the right side. Chris Parrish is going to sort the damaged threads out on the spring hanger bolts and nuts, but the defective one is back in the workshop. A hunt is on for a spare replacement which is thought might be at Hopetown or upstairs in Deviation. If not, then a new one will have to be made which will not be cheap. 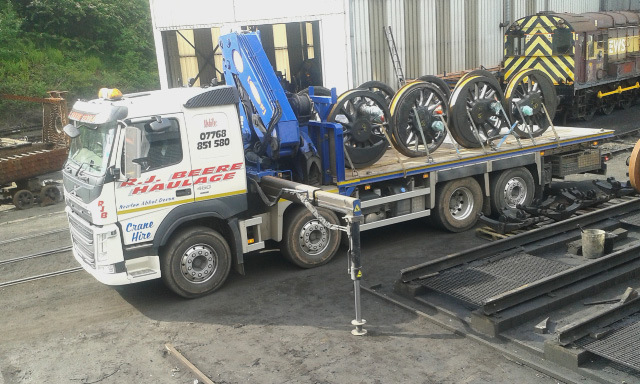 The Q6 wheels were also collected late yesterday afternoon and are now on the way to South Devon Engineering on an eight week turnround.